Oakland Voices is The Oakland Tribune’s 9-month program that trains East Bay residents to tell the stories of their neighborhoods. The Tribune created Oakland Voices as a vehicle for community members to become multimedia storytellers, and to be new voices directly shaping the coverage of this region. Our 2014 media project is based in East Oakland. This year we have 12 residents chosen straight from East Oakland neighborhoods to be OV correspondents. They are trained in digital media storytelling – writing blogs and online pieces, taking photos, shooting video, and using social media to discuss issues that matter most in their communities. Our correspondents also learn journalism ethics and editorial decision-making, interview basics, and story craft. They use those tools to report on a wide range of issues highlighting the triumphs and challenges of life in East Oakland, including community heroes and heroines, health and wealth disparities, and efforts to curb violence. This year, the correspondents will also focus on the East Oakland Building Healthy Communities initiative, writing stories about the work being done across this network of community-baed non-profits to address systemic issues in East Oakland. Oakland Voices relies heavily on the partnership between the Oakland Tribune and The Maynard Institute for Journalism Education. Together, we provide more than a dozen media professionals to teach OV correspondents. Participants work individually and in teams, creating content for OaklandVoices.com, as well as the Oakland Tribune site and newspaper. The collaborative, applied learning approach means correspondents quickly become aware of their power and responsibility as storytellers, and as members of the media. Many of our correspondents join Oakland Voices because they want to reshape common misperceptions of their communities, portraying them instead as dynamic places where real people struggle, succeed, and thrive. Our team members also join OV because they have a passion for telling stories – with the camera, and with the pen. 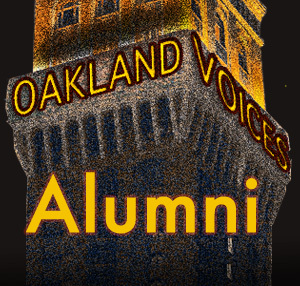 Oakland Voices allows correspondents to explore both their sense of mission and their love for storytelling, while also acquiring skills they can take into their personal and professional lives.